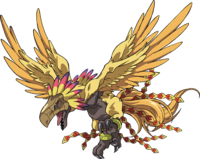 A holy Digimon that possesses four wings that shine gold. 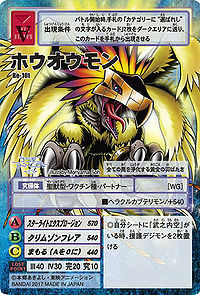 It is the head of all Bird Digimon, and is said to be the one that presides over Holy-species Digimon. 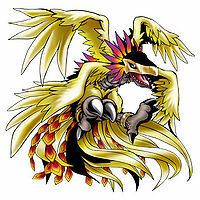 While Holydramon is the ultimate form of Beast Digimon, Hououmon is the ultimate form of Bird Digimon. As proof that it is a Holy-species Digimon, it draws holy power from where it holds its two "Holy Rings", and it is understood that the power possessed by Hououmon is unfathomable. 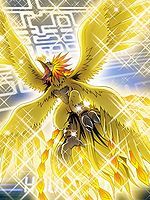 Its Special Move is solemnly flapping its four wings, causing it to rain golden grains (Starlight Explosion). It is said that those who suffer this technique have all of their wickedness purified. Ultimate level, Holy Beast type Digimon. 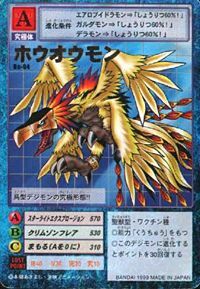 — Digimon Tamers: "Evolutionary Radiance, Shining Evolution"
n., Houou 「鳳凰」 is the Japanese name for a bird from Chinese mythology called the Fenghuang, a symbol of virtue and high grace. In modern times, the Houou has been confused with the Egyptian phoenix. The Phoenix is a legendary fire-bird that was reborn from its ashes when it died. Anime/Manga Digimon Tamers: "Evolutionary Radiance - Shining Evolution"
スターライトエクスプロージョン Sutāraito Ekusupurōjon Starlight Explosion/Crimson Flame Rains golden grains from its wings that purify evil, or explodes with light. クリムゾンフレア Kurimuzon Furea Crimson Flame/Crimson Flare Breathes flames from its mouth. フレイミングウィング Fureimingu Wingu Flaming Wing/Flaming Wings Tackles the enemy from the sky with burning wings. Charges at the enemy while flying. Kyoushū  Assault 強襲 N/A Sky Strike Attacks ferociously from the sky. Generates a wonderful energy that absorbs the enemy's life force. Hououmon in Digimon Adventure tri. 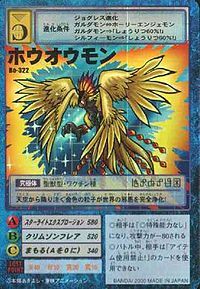 In "Evolutionary Radiance - Shining Evolution", a Hououmon is among the Digimon who evolve to the Ultimate level through the power of Culumon's Shining Evolution, then come to help fight the D-Reaper with the Four Holy Beasts. Hououmon is the partner of Takenouchi Sora. After overcoming her lost friendship with Sora, Piyomon evolves to this form for the first time in "Loss" to protect Sora from Mugendramon. She destroys Mugendramon with the assistance of Seraphimon and Herakle Kabuterimon. A Hououmon is part of the group defending Bagramon's Palace in Jupiter Zone. Hououmon appears as an obtainable Perfect-level Vaccine type Digimon in Digimon World. 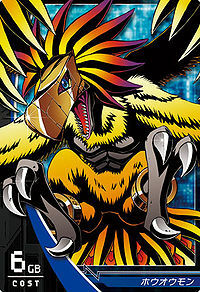 This is the only Digimon media that labels Hououmon along with Herakle Kabuterimon as a Perfect level Digimon instead of Ultimate. This is due to the fact that the game was based on the Digital Monster virtual pets and the Ultimate Level did not exist. 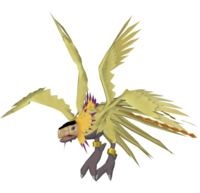 Hououmon, along with Mega Seadramon and Herakle Kabuterimon, are the only obtainable Perfect Digimon that are never seen as NPCs in the game, and the only way to witness one of them is to evolve a Digimon into Hououmon. Bonus conditions: Don't battle at all, have a Discipline of 100% and have at least 28 different techniques mastered. Hououmon's Digivolution item is the Red Ruby which lets any Adult Digimon evolve into Hououmon. 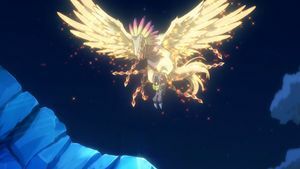 Alternatively, both Birdramon and Cockatrimon can evolve into Hououmon via Death Evolution, in where it must lose a battle, though this only has a 50% chance of happening so its reccomended to save before trying it. Hououmon is the holder of the Speed 7s card. Hououmon is a Perfect in this game. Hououmon is an obtainable Digimon. Evolves from Aero V-dramon (0+ DP), Garudamon (0+ DP) or Lighdramon (0-7 DP). Obtained from mastering Rosemon, possibly another Slide Evolution. Its special is Crimson Flare. 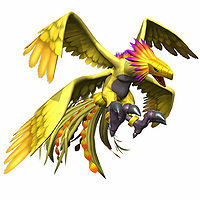 Can be evolved from Garudamon if above level 39 and Bird EXP above 10000, or can be found at Sky Palace. Hououmon evolves from Delumon at LV 52 with 11000 holy and bird exp. It can be found in the far end of Highlight Heaven. Hououmon can be Jogress evolved from Garudamon + Sinduramon. 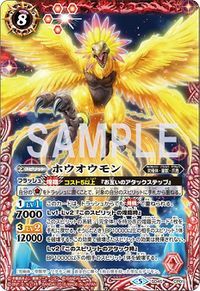 Hououmon evolves from Angewomon, Holy Angemon or Garudamon with 40 Bird AP and 1 egg revert. Evolves from Silphymon and Garudamon at level 41. Hououmon is the evolved form of Rindou Akiho's partner, Piyomon. 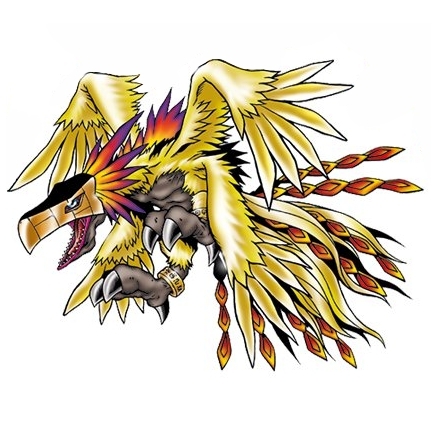 It is also an obtainable Digimon which is evolved from Garudamon. It can also be obtained as a collectible card. Its card is part of the Holy Ring (ホーリーリング Hōrī Ringu) set and the Piyomon Evolution (ピヨモン進化 Piyomon Shinka) set. Hououmon is the partner of Takenouchi Sora. Hououmon is the main evolution of Piyomon, one of the twelve playable characters. It can also be obtained as a collectible DigiCard. Evolves from Garudamon or Aero V-dramon with No Calls, over 60% Win Ratio. 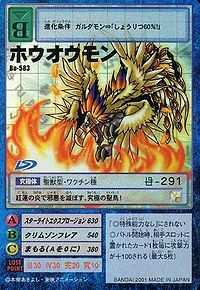 Can evolve from Garudamon X-Antibody with Dragon 6-10, Holy 11-15, Bird 20 or Holy Angemon with Water 6-10, Holy 11-15, Bird 20. 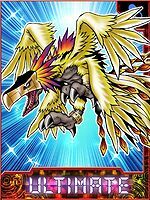 Hououmon is available by DigiXrossing Aquilamon, Zhuqiaomon and Goddramon. The Ultimate form of Bird Digimon! The golden particles that fall from the sky completely purify the world of evil! This ultimate holy bird annihilates evil with its crimson flames! 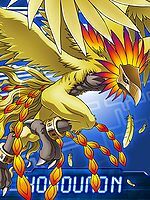 This godly golden bird has reached the pinnacle of all bird type Digimon! This holy bird roasts evil with its wings that burn a golden color! The flapping of its golden wings purifies all evil. 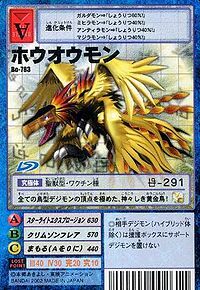 The pinnacle of all Bird Digimon, it possesses four wings that shine golden. It is armed with two Holy Rings, and is said to rule over Holy Digimon. Its strength is immeasurable. 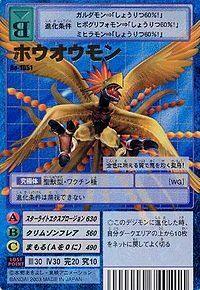 A holy Digimon that possesses four wings that shine gold. Digimon Adventure (Game) Digimon Adventure tri. (Digimon Adventure tri.) Illustration for the Battle Spirits Collaboration Booster: Digimon Our Digimon Adventure. This page was last modified on 8 April 2019, at 00:39.